When you look at this from the outset, it sounds like one of the simplest things to do. But very often when putting together any form of marketing campaign, both online or offline, very often this point gets lost. Where does targeting go wrong? On a micro level there are many places where the sight does not quite line up to the target. Sometimes the creative execution gets in the way and the idea becomes unmanageable. The marketing is stunning and the creative is eye catching and incredibly compelling but somewhere along the way it becomes too complicated. The target market may not have all the technology available to even view the creative and so all of that hard work and creative brilliance is wasted. Very often every creatives, marketing strategists, even copywriters forget that the target market might be completely different from them. The campaign then gets planned and executed for their point of view to meet and achieve their expectations of what would make the campaign successful. This means that we’d have huge complex multi-level campaigns involving smartphones and internet marketing being pitched at low income, low LSM demographics. On a more macro level, there are further pitfalls that can be run into when a company is looking at their marketing initiatives. Again, targeting is an area that needs to be given a lot of thought. This time though; when looking at the target market, we are less concerned about the demographical breakdown of the target market, but rather the critical mass that makes up that target market. This is especially true when looking at a business-to-business marketing model. (Can you tell, I’m NO graphic designer?) What the graphic is basically trying to illustrate is that in the blue pyramid there are a large number of companies at the bottom of the pyramid, this then progresses to fewer companies at the top. When you look at the proportion of revenue generated (orange triangle) by each company in the blue pyramid, proportionally each company at the bottom is making FAR less revenue that those at the top. This means it vitally important that you ensure that when choosing your target market you make sure that the segment you ar going to be going after is big enough to sustain your business into the future. Something which certainly every business owner has learnt since the recession became a buzzword is that if you do not have a sustainable target market in tough times, your business is going to be on permanently shaky ground. 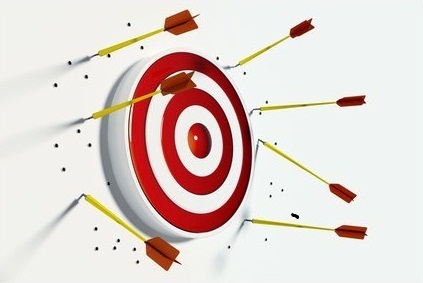 Finding your target market means making sure that you have a sweet spot. You can still market to the areas slightly above and below your core group. But you need a large enough potential group to ensure further success. Social Media : Addiction, Disease or Accepted Social norm? The Marketing of my site worked! Now what?